Helping clients communicate their messages through effective imagery and visuals that create engagement, establish emotional connections with target audiences, and ultimately help them exceed business goals. With more than two decades of television and audiovisual experience, Federico has developed projects for renowned U.S. media outlets including Universal Studios, Univision, Telemundo, FOX Sports and ESPN. He has a knack for all facets of production, from pre-to-post, and everything in-between; specifically, artistic direction, general and executive producing, sound design, video editing, video camera use and live production direction. Television achievements include the direction and post-production of Protagonistas de la Novela, the first–ever reality series airing on Hispanic television in the U.S., and the general production, Oppenheimer Presenta. 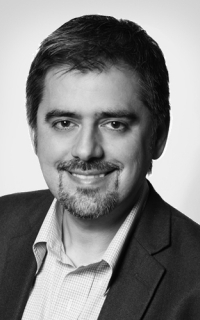 Federico has also worked on numerous integrated campaigns, including multimedia presentations with an “On Demand” feature for clients such as Discovery, HBO, CISCO, and Oracle.